StarGames is one of the largest online gaming sites in Europe, well known for its wide selection of very popular Novomatic games, with over 120 exclusive titles on offer. 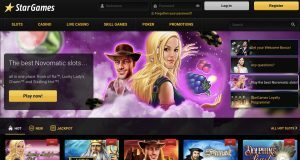 Established in 2008 and licensed and regulated by the Malta Gaming Authority, StarGames is a reputable and trusted online casino that offers a good mix of exclusive land-based slots games, Novomatic mobile casino games, live dealers and unique skills games all under one roof. Players can choose to interface with the StarGames website from an impressive range of 18 European languages. Although the base currency used is the Euro, players can also choose to see their account balances, deposits, wager amounts and payouts in one of a number of currencies, although it should be borne in mind that these conversions are subject to fluctuating exchange rates against the Euro. 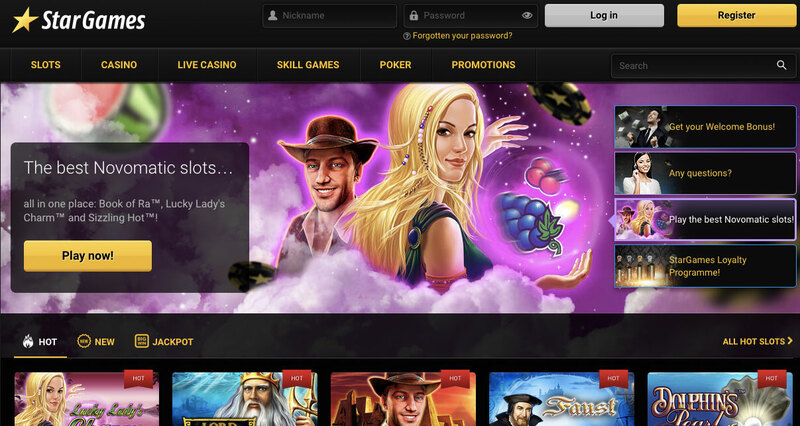 The casino is wholly powered by GreenTube software, the official provider of Novomatic games online. This means that you’ll find the widest range of Novomatic games exclusively at StarGames Casino. 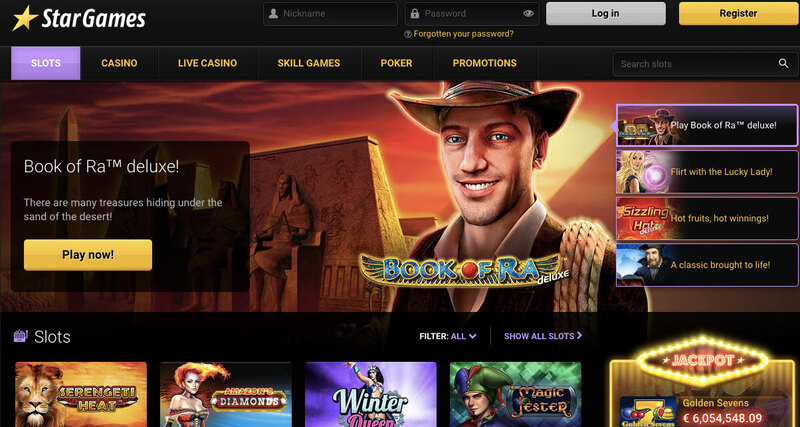 First time depositors receive a 100% match bonus up to €100. For example, if you deposit €50 this amount will be matched with a free €50 added to your initial deposit. The terms are comparatively fair, but with two considerations to keep in mind: Firstly, there is a 1x play through – if you get a €100 bonus you’ll need to wager €100; and secondly, you need to play the same number of games as your bonus. So if your bonus is €100, you need to play 100 games. If one opts to make a withdrawal before the stipulated requirements are met, the bonus will be forfeited. A quirky but fun feature of the site allows a new player to register without paying a deposit and receive 5000 stars to use as ‘currency’ to test-drive games, before committing to signing up and making a deposit. Fans of Novomatic games will enjoy the huge range of slots to choose from, all designed with high quality graphics and a wide variety of themes. These are all formatted in the classic slot structure, and will please those who enjoy the comfort of the familiar if they’ve experienced slot gaming in land-based casinos. Within the mix of games, there are also 19 Jackpot slots, with chances for players to walk away with a small fortune. However, because of the sole games provider on the site, players won’t find the offerings available on other online casinos, such as movie-, TV- and video game-themed slots with 3-D graphics and other innovative features. 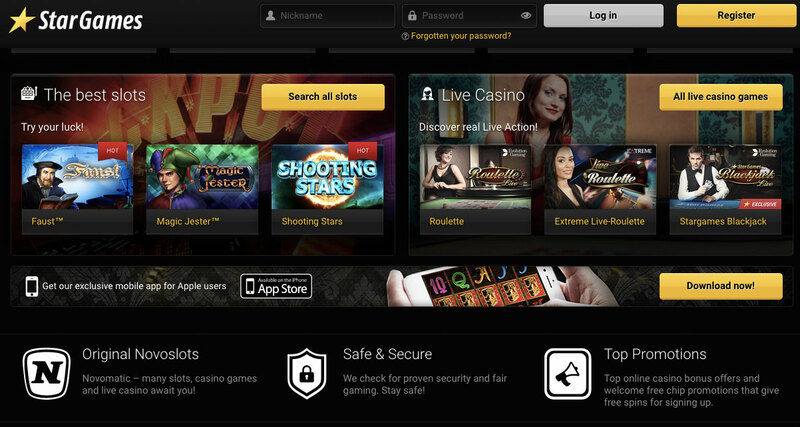 StarGames launched its mobile casino in 2014. 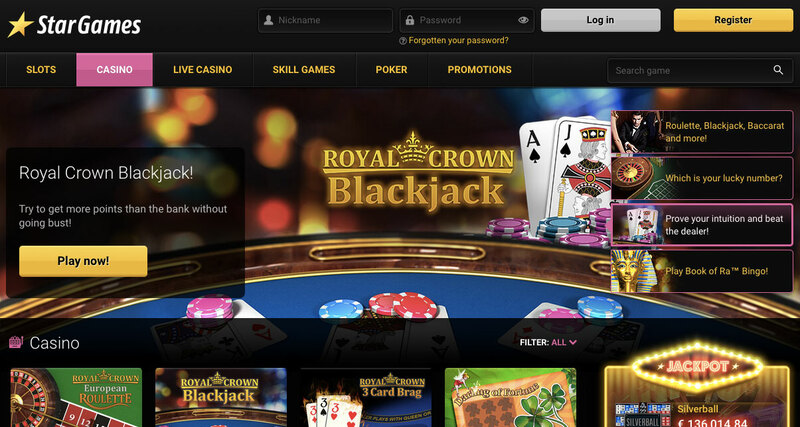 The platform runs on bespoke software that was developed in-house, making its functionality unique, as well as the fact that it is the only mobile casino platform offering the ever-popular Novomatic game slots. 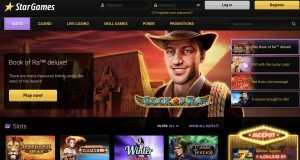 A limited number of the most popular slot games from the large portfolio hosted by the online casino is available for mobile players, with new slots regularly being added to the mix. Mobile players are treated to the same welcome bonus as online players, and are also offered the free play stars to test out games before making a deposit. 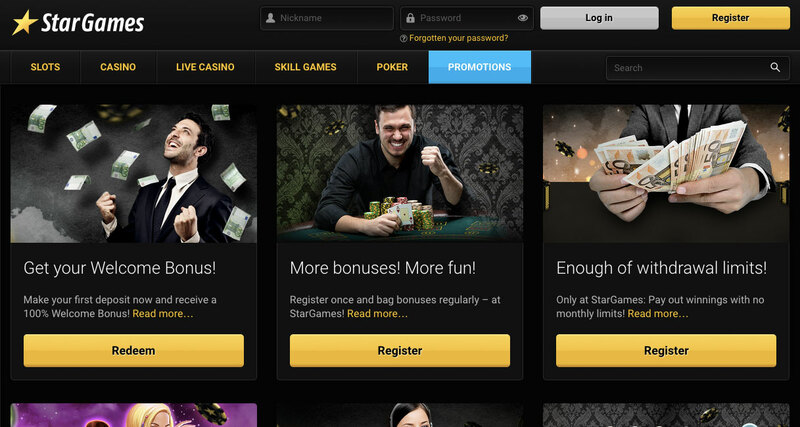 Other than the welcome bonus for first-time depositors, StarGames does not offer any special promotions, besides its fairly industry-standard loyalty rewards program. Members are rated from Bronze all the way up to Diamond status, with monthly bonuses and privileges escalating up the scale. StarGames Casino has a dedicated support team to help with any questions or difficulties. They don’t offer an online live chat service but can be contacted either by email or telephone, with various numbers for different geographical zones listed on their Help page. Operating hours are limited to 8pm –10pm every day of the week. There are a variety of different options players can choose to make a deposit with the StarGames Casino, either via ewallets, credit cards or direct banking. The direct banking options also offer payments via Sofort and Giropay. Accepted credit card include Visa, MasterCard and Maestro. Ewallets include Neteller, Skrill, Ukash and ClickandBuy to name a few. These may change from time to time so check the website or ask their support staff to confirm if your preferred is supported. Withdrawals are somewhat more restricted, but players can still use direct banking, credit cards or ewallets, with ewallets being the fastest way to get paid out. Payouts usually take up to 48 hours, with a small fee chargeable for each transaction. For entry-level players, free withdrawals are limited to twice a month only, with withdrawal opportunities increasing for players at higher levels. StarGame Casino offers players a unique gaming experience with its exclusive range of Novomatic games appealing to lovers of classic land-based slots. While somewhat limited, its mobile casino allows players a lot more flexibility to enjoy their gaming anytime and anywhere. Backed by a solid reputation for reliability and security, StarGame is a safe bet for high-level gaming entertainment.